This beautiful brooch is one of the few surviving pieces from a large hoard of Pictish metalwork found by a workman in 1868 at Rogart in Sutherland during railway construction. The brooch is of silver with cast gilt interlace decoration made in a technique called chip carving. There are settings for nine studs, all of which are now missing. It dates from the 8th century. 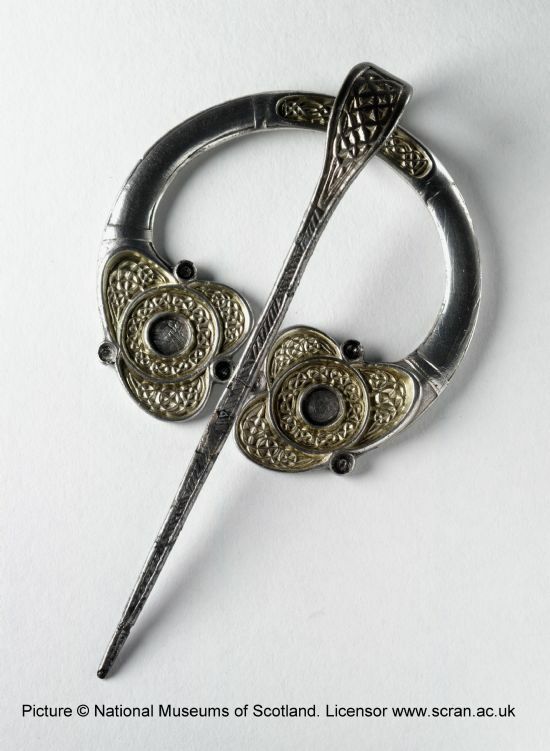 The form of the brooch, with its expanded decorated terminals, decorated panel in the hoop, and flat, decorated pin is typical of brooches found in the north and east of Scotland, in the Pictish area of Scotland. Some, as in this case and one other from the hoard are of silver, but others are of bronze. They vary in size from ostentatious examples such as this one (diameter 7.7 cm) to very small ones, as the moulds found on the Brough of Birsay, Orkney demonstrate. Other brooches of this type from the Highlands include a brooch found at Achavrole, Dunbeath and fragments from a metalworker's hoard from Croy near Inverness; bronze examples include examples from Bay on Skyle and Surreray, Caithness. Recently a pin of the sort found with these brooches was found at Conon Bridge. Another cluster of large, silver-gilt brooches is known from Highland Perthshire. The Old Name Book of the 1st edition Ordnance Survey of the 1870s mentions 9 brooches found, but there may have been as many as 11 as well as other objects. They were quickly dispersed, and only the two silver exampes in the National Museums of Scotland survive and possible fragments of four others traced (Henderson & Henderson 2004, p. 102, 223). A bronze silver-gilt example in Dunrobin Castle Museum is said to be from the find. The owner of the Rogart hoard would have been a wealthy individual, with the brooches worn to indicate status and power. The woman riding a horse depicted on the Hilton of Cadboll stone wears such a brooch. Susan Youngs (ed.) 1989. 'The Work of Angels': Masterpieces of Celtic Metalwork, 6th-9th centuries AD, London: British Museum Publications. Henderson, George and Isobel 2004. The art of the Picts : sculpture and metalwork in early medieval Scotland, London: Thames and Hudson.